Università degli Studi di Urbino Carlo BoDipartimento di Economia e Metodi Quantitativi Calcagnini G., Favaretto I., Rombaldoni R. Italian SMEs in the. 2 Università degli Studi di Urbino Carlo BoDipartimento di Economia e Metodi Quantitativi Calcagnini G., Favaretto I., Rombaldoni R. Italian SMEs in the Aftermath of the Crisis: Is there a New Model – Urbino, October 20th Trends in the Italian economy before the current economic crisis During the 1971-1981 period Italian firm size decreased: the number of new firms was larger than the increase in employees. 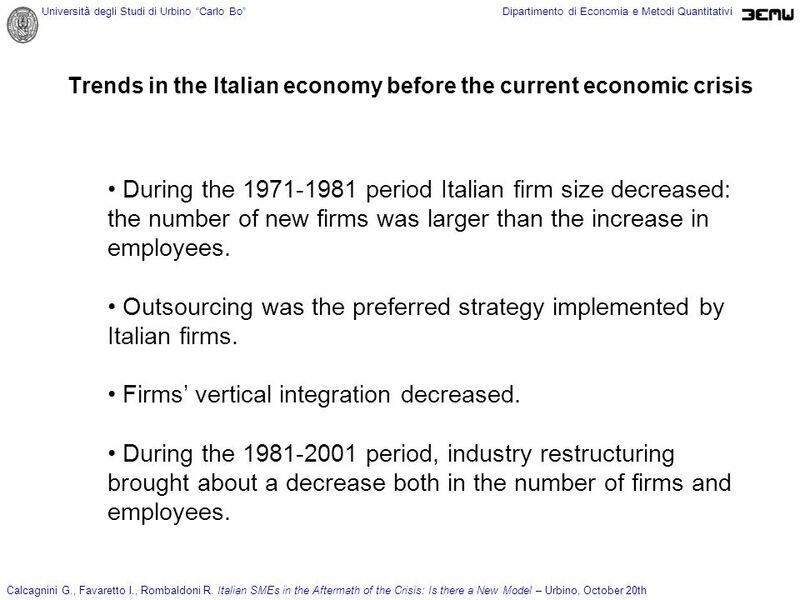 Outsourcing was the preferred strategy implemented by Italian firms. Firms vertical integration decreased. During the 1981-2001 period, industry restructuring brought about a decrease both in the number of firms and employees. 3 Università degli Studi di Urbino Carlo BoDipartimento di Economia e Metodi Quantitativi Calcagnini G., Favaretto I., Rombaldoni R. Italian SMEs in the Aftermath of the Crisis: Is there a New Model – Urbino, October 20th Trends in the Italian economy before the current economic crisis Following these changes, between 1990 and 2003 the yearly average GDP growth rate of Italy (1,47%) was lower than that of the European Union (15 countries). The cumulated difference in GDP growth rates summed up to 7,3%. This result is also confirmed by per-capita GDP growth rates. This divergence with Europe is strongly connected with the structural characteristics of our productive system. 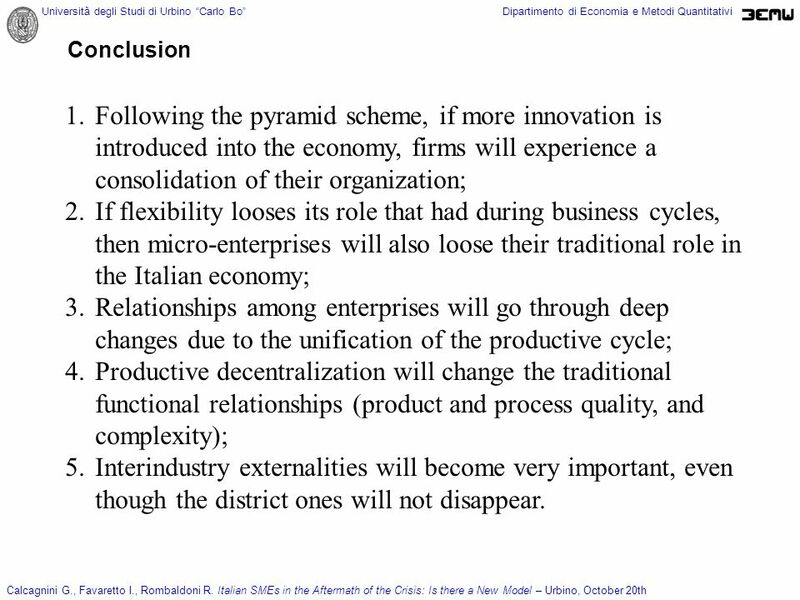 A non-marginal explanation for the difficulties shown by the Italian economy is to be found in its industry composition, specifically in its concentration in industries showing low- and medium technology intensity. 5 Università degli Studi di Urbino Carlo BoDipartimento di Economia e Metodi Quantitativi Calcagnini G., Favaretto I., Rombaldoni R. Italian SMEs in the Aftermath of the Crisis: Is there a New Model – Urbino, October 20th Trends in the Italian economy before the current economic crisis During the 1971-2001 period, supplier-dominated industries (Textile, Clothing, Leather, Shoes, Furniture, etc. characterized by small-sized firms) shown a relatively stable size. Further, supplier-dominated industries shown a strengthening of their production model based on industrial districts. This successful model, based on small-sized firms, allowed businesses to better and faster adapt to changing market conditions. 6 Università degli Studi di Urbino Carlo BoDipartimento di Economia e Metodi Quantitativi Calcagnini G., Favaretto I., Rombaldoni R. Italian SMEs in the Aftermath of the Crisis: Is there a New Model – Urbino, October 20th Trends in the Italian economy before the current economic crisis In scale-intensive industries (steel, glass, durable consumption goods such as automobile, characterized by large-sized firms) average firm size progressively decreased. 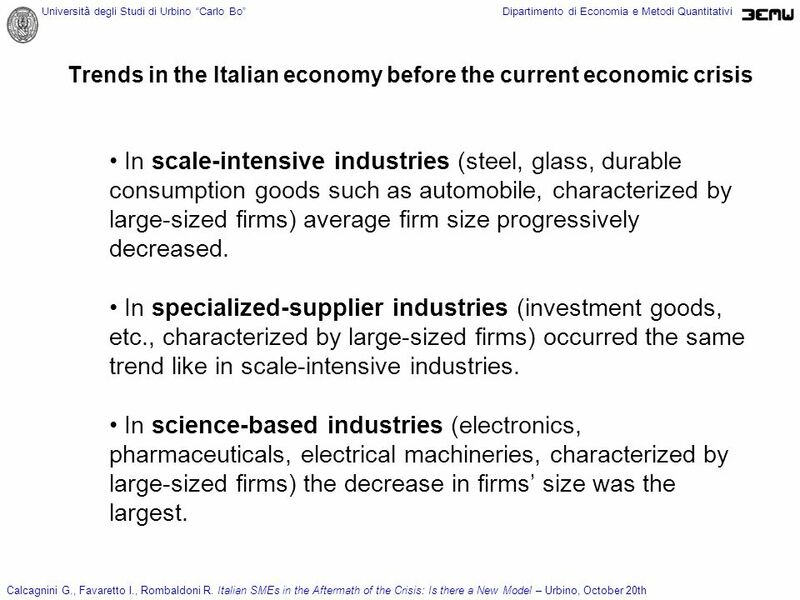 In specialized-supplier industries (investment goods, etc., characterized by large-sized firms) occurred the same trend like in scale-intensive industries. 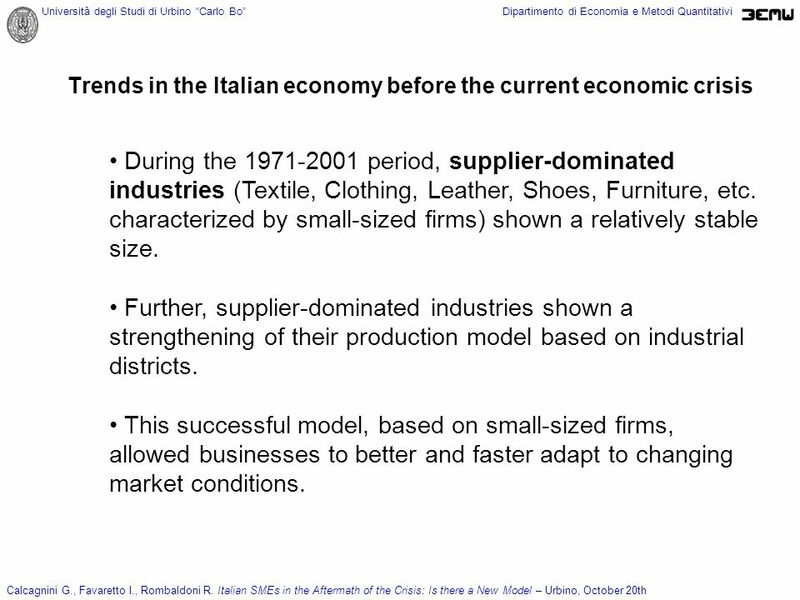 In science-based industries (electronics, pharmaceuticals, electrical machineries, characterized by large-sized firms) the decrease in firms size was the largest. 8 Università degli Studi di Urbino Carlo BoDipartimento di Economia e Metodi Quantitativi Calcagnini G., Favaretto I., Rombaldoni R. Italian SMEs in the Aftermath of the Crisis: Is there a New Model – Urbino, October 20th Most recent trends During the most recent period the average firms size of supplier- dominated industries showed a slight increase because the decrease in the number of firms was proportionally larger than the decrease in the number of employees. 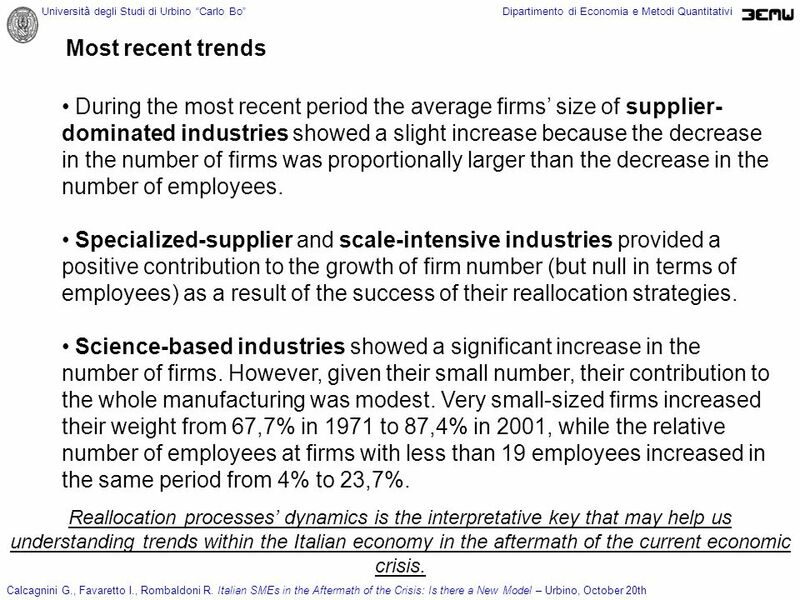 Specialized-supplier and scale-intensive industries provided a positive contribution to the growth of firm number (but null in terms of employees) as a result of the success of their reallocation strategies. Science-based industries showed a significant increase in the number of firms. However, given their small number, their contribution to the whole manufacturing was modest. Very small-sized firms increased their weight from 67,7% in 1971 to 87,4% in 2001, while the relative number of employees at firms with less than 19 employees increased in the same period from 4% to 23,7%. Reallocation processes dynamics is the interpretative key that may help us understanding trends within the Italian economy in the aftermath of the current economic crisis. 9 Università degli Studi di Urbino Carlo BoDipartimento di Economia e Metodi Quantitativi Calcagnini G., Favaretto I., Rombaldoni R. Italian SMEs in the Aftermath of the Crisis: Is there a New Model – Urbino, October 20th The decade of the crisis. What happened? 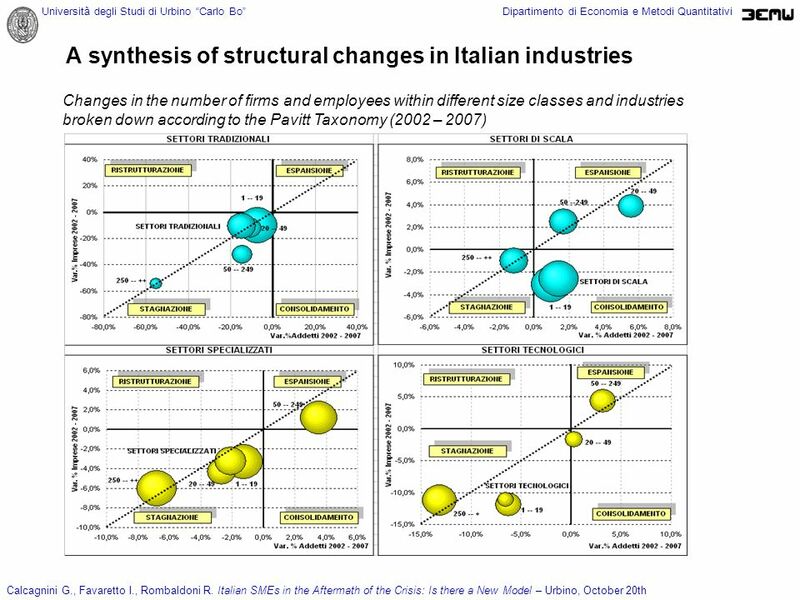 The index of vertical integration does not show, during the period 2002 – 2007, significant differences among industries when the Pavitt taxonomy is used. 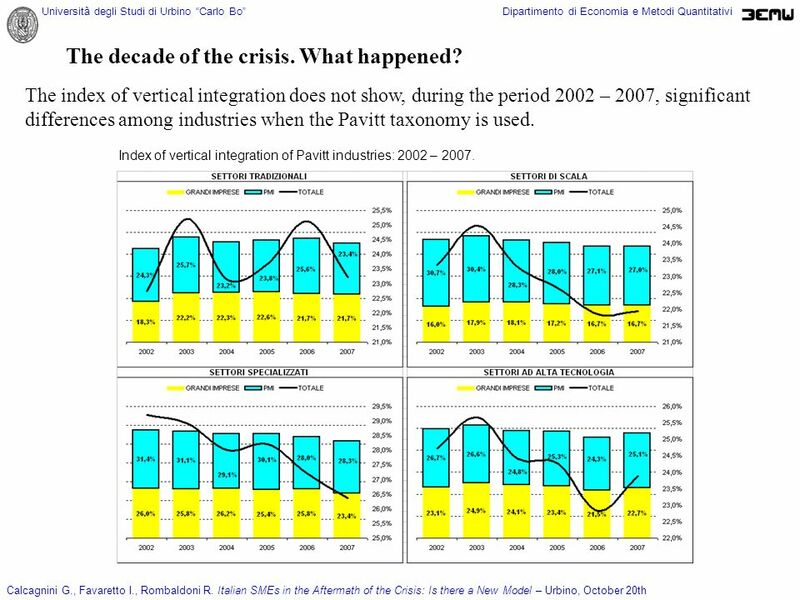 Index of vertical integration of Pavitt industries: 2002 – 2007. 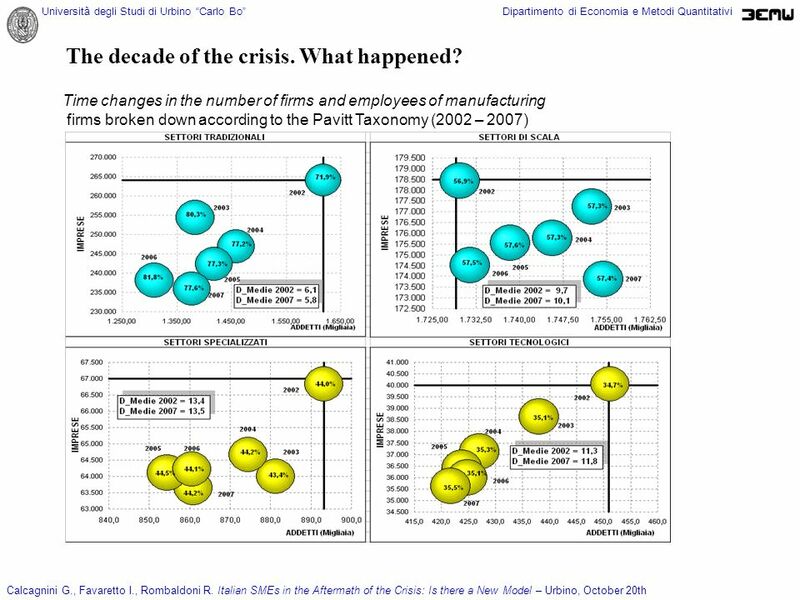 11 Università degli Studi di Urbino Carlo BoDipartimento di Economia e Metodi Quantitativi Calcagnini G., Favaretto I., Rombaldoni R. Italian SMEs in the Aftermath of the Crisis: Is there a New Model – Urbino, October 20th The decade of the crisis. What happened? Small-sized firm belonging to supplier-dominated industries, during the period 2002 – 2007, increased their share of employees, but their average size slightly decreased from 6,1 to 5,8. Small-sized firm belonging to scale-intensive industries showed a relatively stable share of employees, but their average size significantly increased mainly due a reduction in the number of firms. 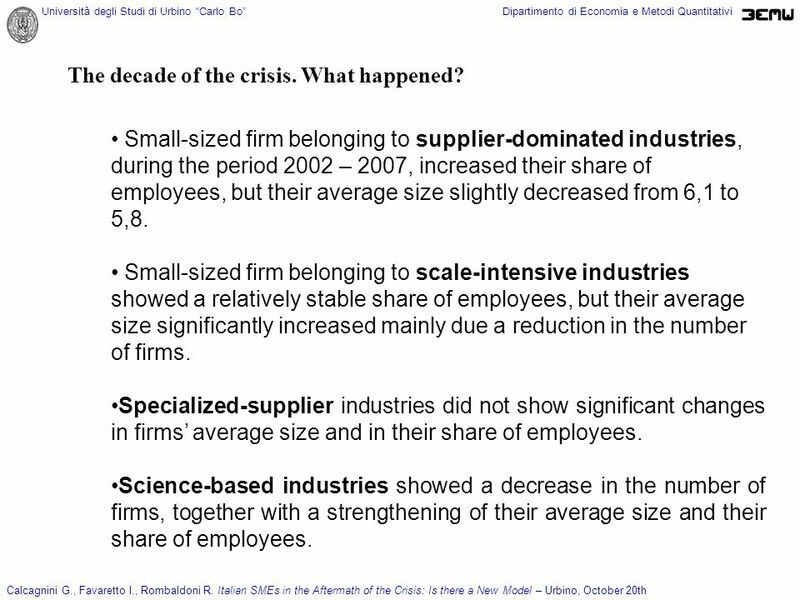 Specialized-supplier industries did not show significant changes in firms average size and in their share of employees. Science-based industries showed a decrease in the number of firms, together with a strengthening of their average size and their share of employees. 13 Università degli Studi di Urbino Carlo BoDipartimento di Economia e Metodi Quantitativi Calcagnini G., Favaretto I., Rombaldoni R. Italian SMEs in the Aftermath of the Crisis: Is there a New Model – Urbino, October 20th A synthesis of structural changes in Italian industries From the previous figure we note that: Stagnation is observable in all industries However, in supplier-dominated industries stagnation is pervasive and involves all firm sizes In scale-intensive industries stagnation is minimal and firms are more oriented to size consolidation and expansion Science-based industries show the greatest variability among firms experiencing stagnation and those experiencing expansion. 14 Università degli Studi di Urbino Carlo BoDipartimento di Economia e Metodi Quantitativi Calcagnini G., Favaretto I., Rombaldoni R. Italian SMEs in the Aftermath of the Crisis: Is there a New Model – Urbino, October 20th A synthesis of structural changes in Italian industries Table 1 – All Firms Net Entry Rates: 2006-2009 Source: European Commission, SME under Pressure, Annual Report 2010) In 2008 and 2009 entry (registration) growth rates significantly decreased in all countries, while exit (cancellation) growth rates significantly increased. 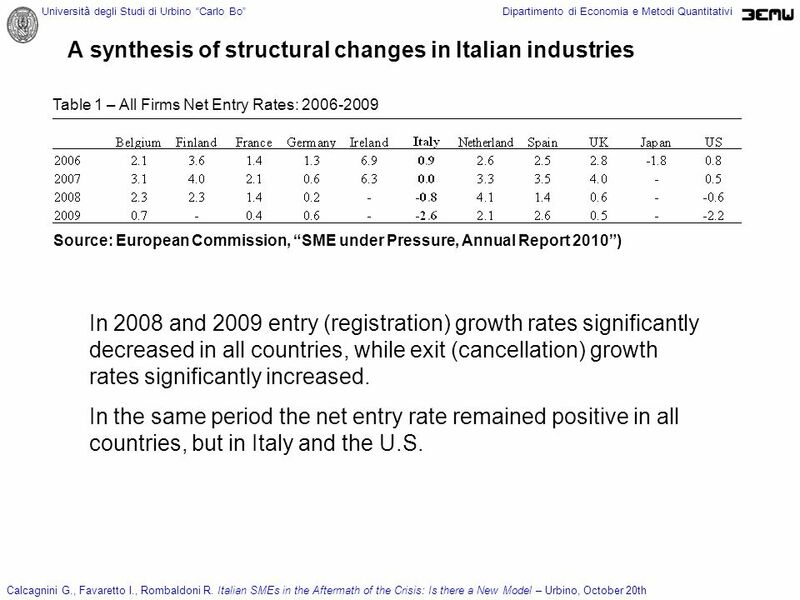 In the same period the net entry rate remained positive in all countries, but in Italy and the U.S.
15 Università degli Studi di Urbino Carlo BoDipartimento di Economia e Metodi Quantitativi Calcagnini G., Favaretto I., Rombaldoni R. Italian SMEs in the Aftermath of the Crisis: Is there a New Model – Urbino, October 20th A synthesis of structural changes in Italian industries Table 2 - Italian firm demography: 2003-2009. 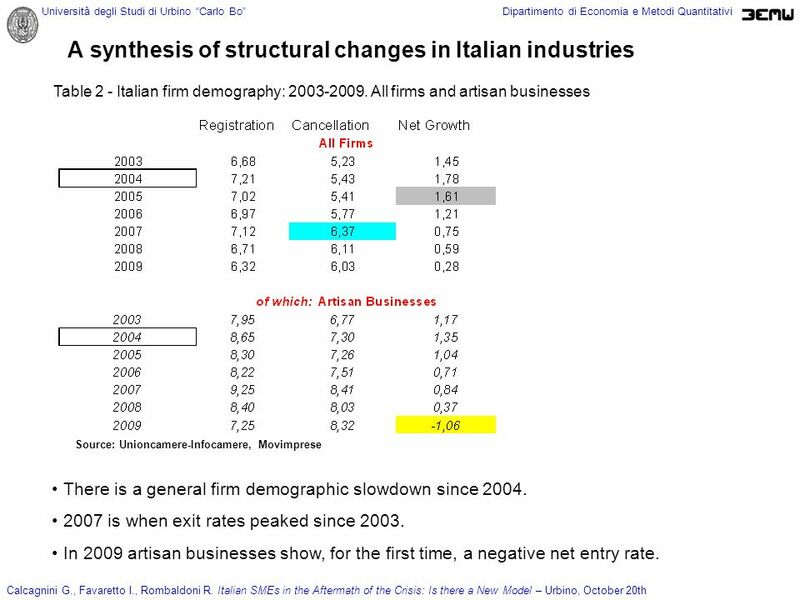 All firms and artisan businesses Source: Unioncamere-Infocamere, Movimprese There is a general firm demographic slowdown since 2004. 2007 is when exit rates peaked since 2003. In 2009 artisan businesses show, for the first time, a negative net entry rate. 16 Università degli Studi di Urbino Carlo BoDipartimento di Economia e Metodi Quantitativi Calcagnini G., Favaretto I., Rombaldoni R. Italian SMEs in the Aftermath of the Crisis: Is there a New Model – Urbino, October 20th Crisis and Restructuring Table 3. 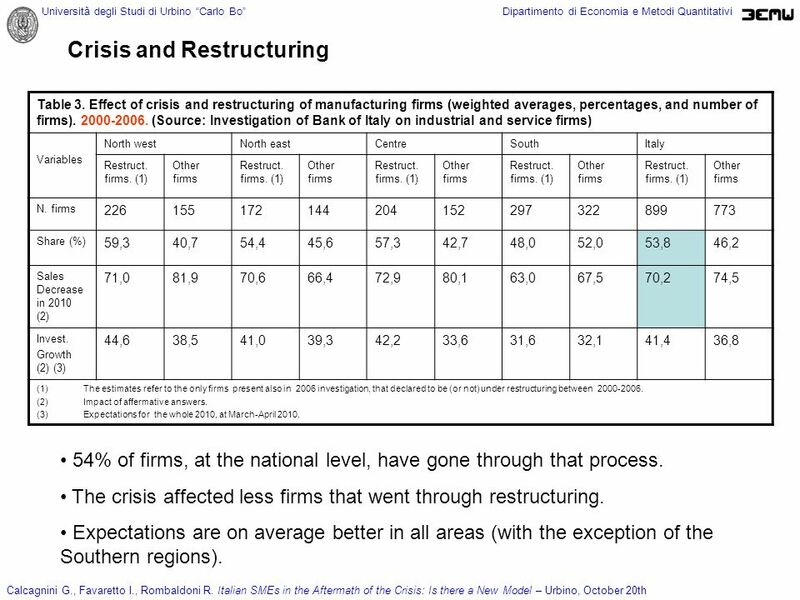 Effect of crisis and restructuring of manufacturing firms (weighted averages, percentages, and number of firms). 2000-2006. 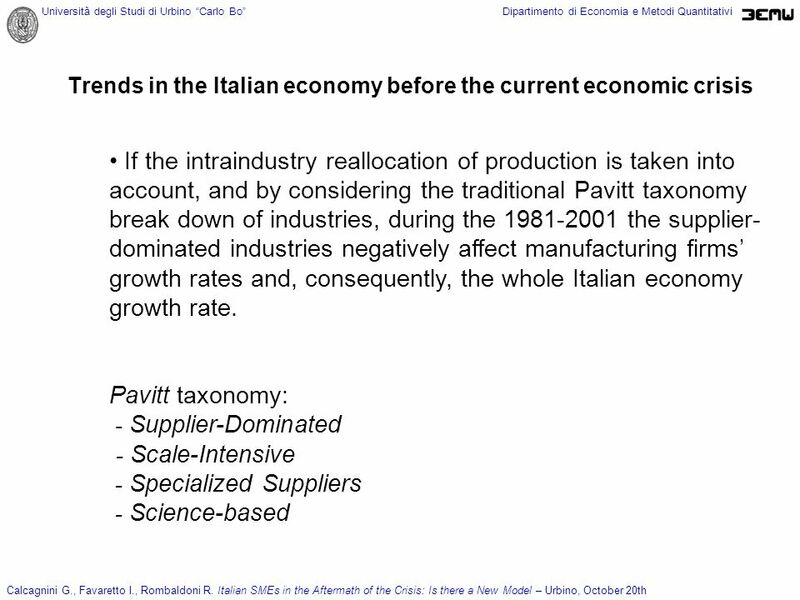 (Source: Investigation of Bank of Italy on industrial and service firms) Variables North westNorth eastCentreSouthItaly Restruct. firms. (1) Other firms Restruct. firms. (1) Other firms Restruct. firms. (1) Other firms Restruct. firms. (1) Other firms Restruct. firms. (1) Other firms N. firms 226155172144204152297322899773 Share (%) 59,340,754,445,657,342,748,052,053,846,2 Sales Decrease in 2010 (2) 71,081,970,666,472,980,163,067,570,274,5 Invest. Growth (2) (3) 44,638,541,039,342,233,631,632,141,436,8 (1)The estimates refer to the only firms present also in 2006 investigation, that declared to be (or not) under restructuring between 2000-2006. (2)Impact of affermative answers. (3)Expectations for the whole 2010, at March-April 2010. 54% of firms, at the national level, have gone through that process. The crisis affected less firms that went through restructuring. Expectations are on average better in all areas (with the exception of the Southern regions). 17 Università degli Studi di Urbino Carlo BoDipartimento di Economia e Metodi Quantitativi Calcagnini G., Favaretto I., Rombaldoni R. Italian SMEs in the Aftermath of the Crisis: Is there a New Model – Urbino, October 20th Crisis and Restructuring Firms that invested in R&S (55,1%) have less frequently registered sales reductions. Expectations on sales and investments are better in the North of Italy. Table 4. 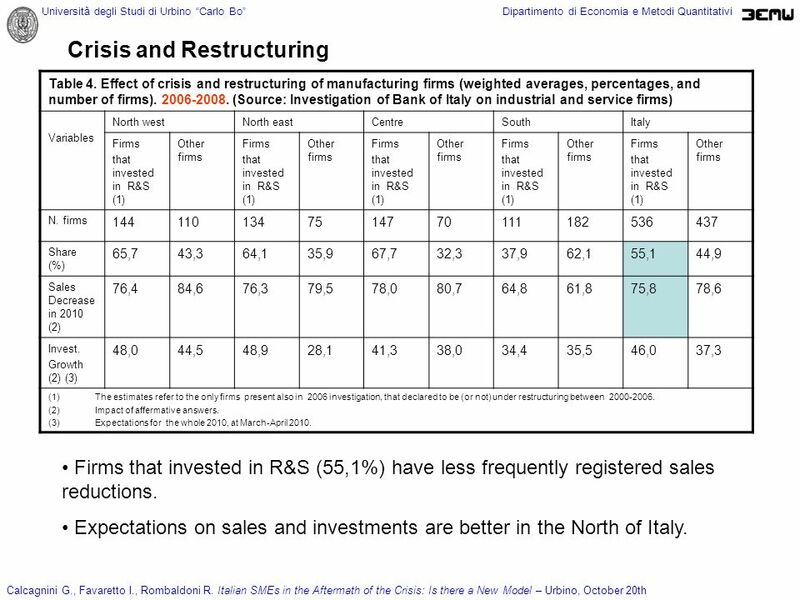 Effect of crisis and restructuring of manufacturing firms (weighted averages, percentages, and number of firms). 2006-2008. 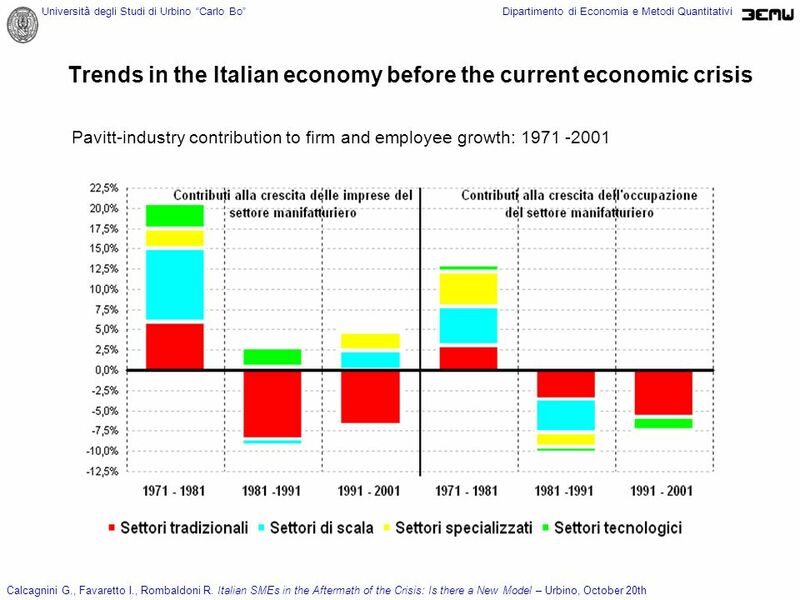 (Source: Investigation of Bank of Italy on industrial and service firms) Variables North westNorth eastCentreSouthItaly Firms that invested in R&S (1) Other firms Firms that invested in R&S (1) Other firms Firms that invested in R&S (1) Other firms Firms that invested in R&S (1) Other firms Firms that invested in R&S (1) Other firms N. firms 1441101347514770111182536437 Share (%) 65,743,364,135,967,732,337,962,155,144,9 Sales Decrease in 2010 (2) 76,484,676,379,578,080,764,861,875,878,6 Invest. Growth (2) (3) 48,044,548,928,141,338,034,435,546,037,3 (1)The estimates refer to the only firms present also in 2006 investigation, that declared to be (or not) under restructuring between 2000-2006. (2)Impact of affermative answers. (3)Expectations for the whole 2010, at March-April 2010. 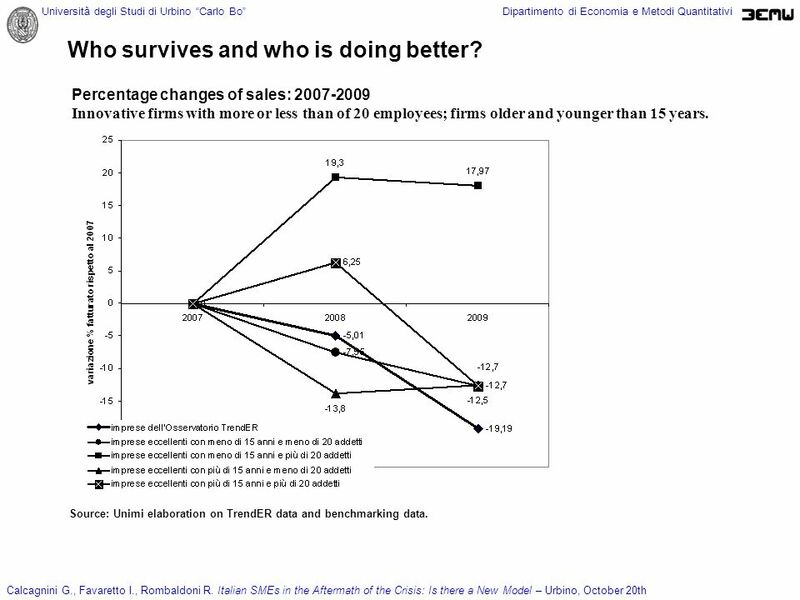 18 Università degli Studi di Urbino Carlo BoDipartimento di Economia e Metodi Quantitativi Calcagnini G., Favaretto I., Rombaldoni R. Italian SMEs in the Aftermath of the Crisis: Is there a New Model – Urbino, October 20th Who survives and who is doing better? 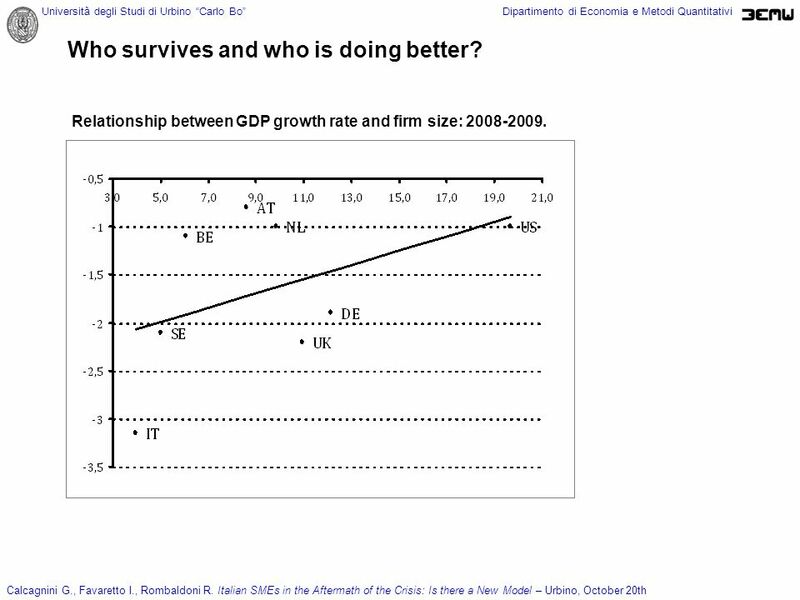 Relationship between GDP growth rate and firm size: 2008-2009. 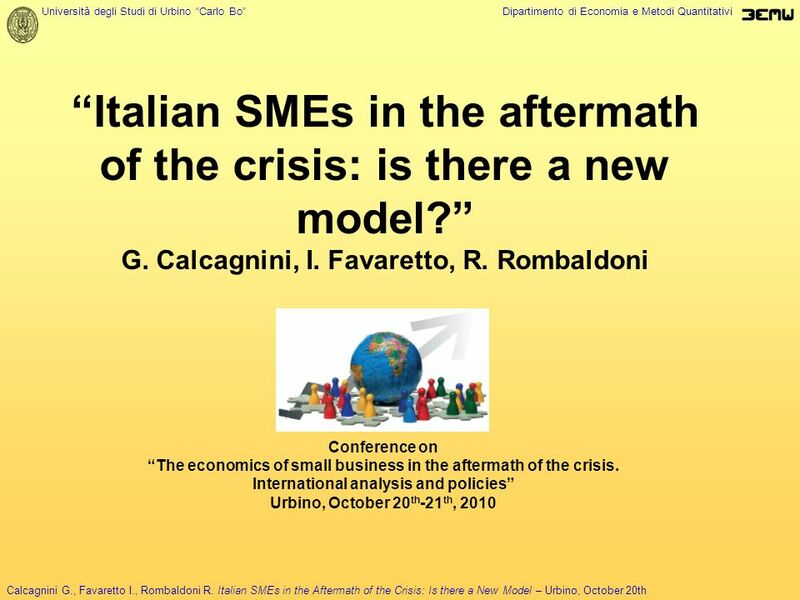 19 Università degli Studi di Urbino Carlo BoDipartimento di Economia e Metodi Quantitativi Calcagnini G., Favaretto I., Rombaldoni R. Italian SMEs in the Aftermath of the Crisis: Is there a New Model – Urbino, October 20th Who survives and who is doing better? Percentage changes of sales: 2007-2009 Innovative firms with more or less than of 20 employees; firms older and younger than 15 years. Source: Unimi elaboration on TrendER data and benchmarking data. 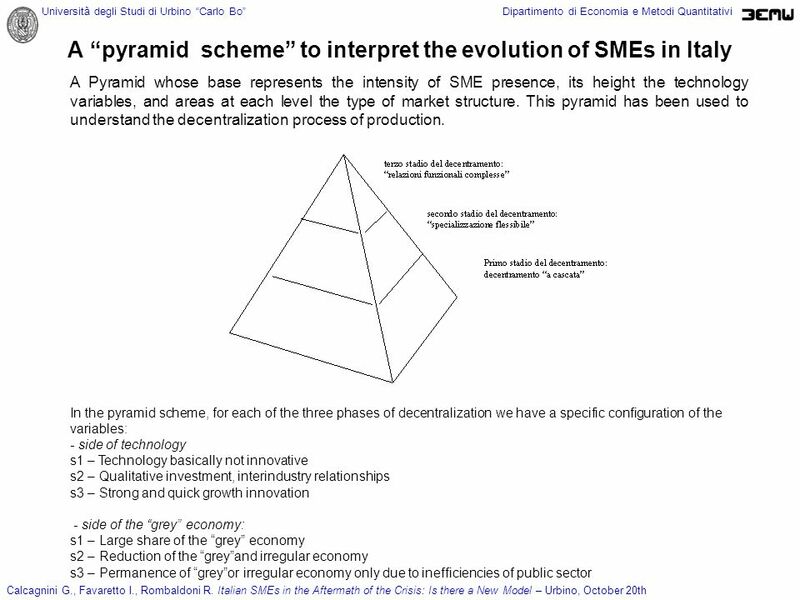 21 Università degli Studi di Urbino Carlo BoDipartimento di Economia e Metodi Quantitativi Calcagnini G., Favaretto I., Rombaldoni R. Italian SMEs in the Aftermath of the Crisis: Is there a New Model – Urbino, October 20th Conclusion 1.Following the pyramid scheme, if more innovation is introduced into the economy, firms will experience a consolidation of their organization; 2.If flexibility looses its role that had during business cycles, then micro-enterprises will also loose their traditional role in the Italian economy; 3.Relationships among enterprises will go through deep changes due to the unification of the productive cycle; 4.Productive decentralization will change the traditional functional relationships (product and process quality, and complexity); 5.Interindustry externalities will become very important, even though the district ones will not disappear. 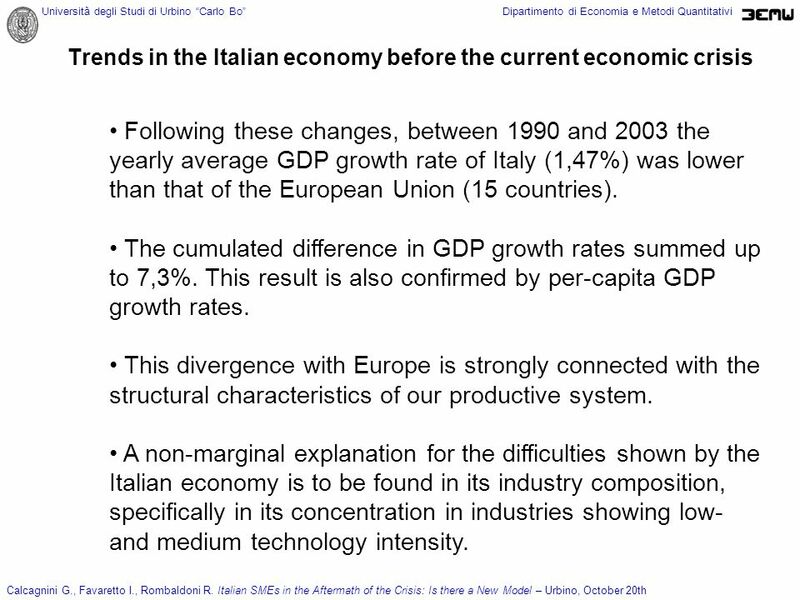 Download ppt "Università degli Studi di Urbino Carlo BoDipartimento di Economia e Metodi Quantitativi Calcagnini G., Favaretto I., Rombaldoni R. Italian SMEs in the." Non-technical innovation Definition, Measurement & Policy Implications Workshop Karlsruhe, October 2008 The employment impact of technological and. Bank Efficiency and Market Structure: What Determines Banking Spreads in Armenia? Era Dabla Norris and Holger Floerkemeier. ORGANISATION FOR ECONOMIC CO-OPERATION AND DEVELOPMENT ORGANISATION DE COOPÉRATION ET DE DEVELOPMENT ÉCONOMIQUES OECDOCDE 1 Entrepreneurship International. Asian Drivers and Poor Countries: The Research Agenda Jörg Mayer UNCTAD China and India: Whats in it for Africa? Paris, March 2006. 1 Alternative measures of well-being Joint work by ECO/ELSA/STD. Insurance corporations and pension funds in OECD countries Massimo COLETTA (Bank of Italy) Belén ZINNI (OECD) WPFS 2011, October. Re-design of the trade in commercial services program in Canada October 2010 OECD Working Party on Trade in Goods and Services. REGIONAL EDUCATION INDICATORS PROJECT Progress towards the achievement of the Summit of the Americas Goals November 14, 2007. Firm-Level Productivity in Bangladesh Manufacturing Industries Ana M. Fernandes The World Bank (DECRG) Bangladesh: A Strategy for Growth and Employment. 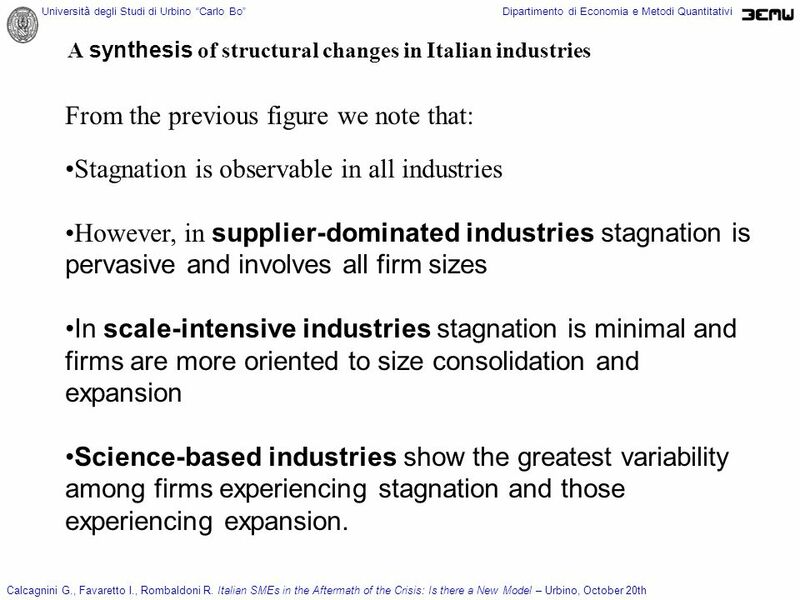 TECHNOLOGY ADOPTION, PRODUCTIVITY, AND FIRM SIZE: THE CASE OF ITALY Matteo Bugamelli, Federico Cingano and Salvatore Rossi Bank of Italy Knowledge Economy. KNOWLEDGE CREATION AND ABSORPTION: THE REGIONAL DIMENSION Alessandro Sterlacchini UNIVERSITÀ POLITECNICA DELLE MARCHE KNOWLEDGE. Russian industrial firms: Absorptive Capacity and State Innovation Policy VI Knowledge Economy Forum: Technology Acquisition and Knowledge Networks VI. GROWING REGIONS, GROWING EUROPE Fourth Report on Economic and Social Cohesion By Prof. Danuta Hübner Brussels, 30 May 2007. Research and Innovation Research and Innovation State of the Innovation Union Clara de la Torre Director of Research and Innovation DG Research and Innovation. European Economic and Social Committee consultative commission on industrial change The global financial crisis and industrial changes in the main European. University of Athens, GREECE Innovation and regional development : Prof. Lena J. Tsipouri.